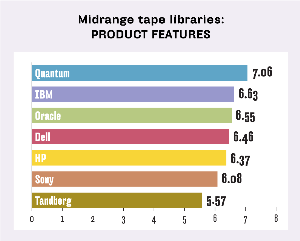 After finishing well but never winning in past Quality Awards surveys, Quantum tape libraries romped through both the enterprise and midrange categories this time around. 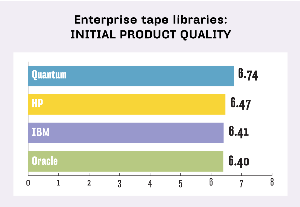 Quantum Corp., one of the brand names that helps define the tape library category, has finished among the top three in three of our previous five Quality Awards surveys for enterprise tape libraries. 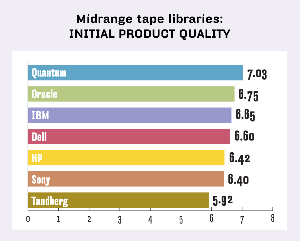 The following vendors/model lines of enterprise-class and midrange tape libraries were included in this Quality Awards survey. The total number of responses for each finalist is shown in parentheses. In the sixth edition of the service and reliability ratings, it breaks through with an impressive overall win highlighted by a clean sweep of the five rating categories. 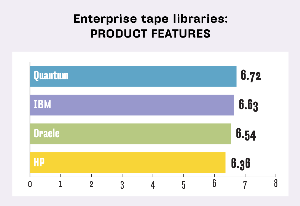 If that wasn’t sweet enough, Quantum also topped the charts among midrange tape libraries, equaling its enterprise feat of five category wins and romping to victory. That’s not to suggest the other product lines represented in the survey were slouches -- the average of the overall scores for enterprise products was second to only the last Quality Awards survey, and the midrange group’s overall average missed a record by a mere 0.04 points. Tape might be playing a diminished or modified role in a lot of storage shops, but based on the consistently high ratings this category receives, we can only conclude the products are more fully featured, easier to use and more reliable than ever. Enterprise. 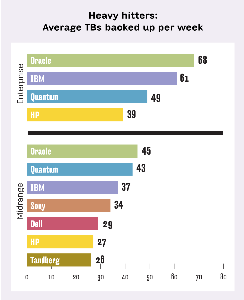 Quantum’s overall average of 6.55 outpaced tough competitors in IBM (6.37) and Oracle Corp. (6.34). IBM was particularly tenacious, finishing second in three categories and third in the other two. Oracle rode one second-place finish and consistently strong scores to its third-place finish. 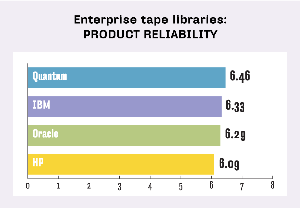 Enlarge ENTERPRISE TAPE LIBRARIES: OVERALL RATINGS diagram. In winning, Quantum showed particular strength in the initial product quality and technical support categories. It won the other categories with smaller but still convincing margins. Coming in second this time, IBM maintained its record of always finishing in the top three since the inception of the enterprise tape library Quality Award surveys. Midrange. Quantum bested an even larger field of competitors in the midrange group and won by an even larger margin -- 6.86 to 6.52 -- over IBM. As it did in the enterprise group, IBM displayed remarkable consistency, adding this second-place finish to its four seconds and one third in previous surveys. Oracle placed third with a 6.42 that just trailed IBM. But Quantum’s mastery of the midrange was clear, with across-the-board category wins in the five rating categories and the only above-7.00 category ratings for product features (7.06) and initial product quality (7.03). In a near replay of the enterprise contest, IBM came in second in four of the five categories, ceding the second spot to Oracle for initial product quality. Enlarge MIDRANGE TAPE LIBRARIES: OVERALL RATINGS diagram. Enterprise. Quantum sure knows how to start out on the right foot with its users -- at least the survey numbers certainly suggest that. Quantum scored highest on all six statements in the sales-force competence category for a total of 6.33, with IBM (6.21) nipping at its heels for each statement. 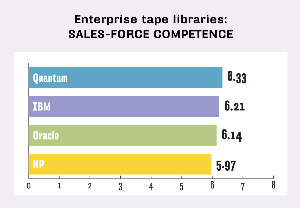 Enlarge ENTERPRISE TAPE LIBRARIES: SALES-FORCE COMPETENCE diagram. Oracle just missed an all-6.00-plus score sheet, dipping a mere 0.03 below on one statement, but notching a solid 6.27 for having a knowledgeable support team. Midrange. Quantum was nearly as awesome among the midrange products, garnering top scores on five of the six statements for an impressive 6.61. IBM just barely nudged out Quantum (6.44 to 6.41) for the statement “My sales rep keeps my interests foremost.” IBM’s 6.44 average put it in second, with Oracle (6.31) taking third. Dell Inc. and Hewlett-Packard (HP) Co. also netted scores higher than 6.00. 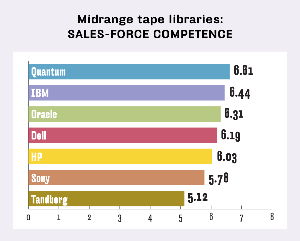 Enlarge MIDRANGE TAPE LIBRARIES: SALES-FORCE COMPETENCE diagram. Quantum was consistently strong in this category, with its top scores for knowledgeable support teams (6.76) and being easy to negotiate with (6.75). IBM and Oracle received 6.00-or-higher scores on all six statements, while Dell just barely missed that mark with a 5.99 on one statement. The Storage magazine/SearchStorage.com Quality Awards are designed to identify and recognize products that have proven their quality and reliability in actual use. Results are derived from a survey of qualified readers who assess products in five main categories: sales-force competence, initial product quality, product features, product reliability and technical support. Our methodology incorporates statistically valid polling that eliminates market share as a factor. Indeed, our objective is to identify the most reliable products on the market regardless of vendor name, reputation or size. Products are rated on a scale of 1.00 to 8.00, where 8.00 is the best score. A total of 783 respondents provided 930 tape library evaluations. Enterprise. Quantum built an average score of 6.74 by beating the competition on every statement in this category. But once again, all the vendors scored well, with HP, IBM and Oracle trailing the leader but just 0.07 points apart. And all vendors earned 6.00 or higher on all six of the category statements. Enlarge ENTERPRISE TAPE LIBRARIES: INITIAL PRODUCT QUALITY diagram. Quantum’s scoring was again notably consistent, topped by three 6.83 ratings for products that require little daily intervention, provide ease of use and represent good value. Tape vendors must be doing something right: IBM (6.63) and HP (6.62) had their highest marks for ease of use, while Oracle’s 6.49 was its second highest score. The group’s 6.50 average in this category stands second only to the previous survey’s 6.67. Midrange. Quantum might have been building up its momentum as it charged through the other categories: It cracked the 7.00 mark for four of the six statements in initial product quality on its way to a category average of 7.03 -- one of its two 7.00-plus category scores. Oracle, with a score of 6.75 that could have been a category winner in other years, placed second, with IBM not far off the pace at 6.65. Enlarge MIDRANGE TAPE LIBRARIES: INITIAL PRODUCT QUALITY diagram. Quantum snapped up 7.00-plus scores for needing little intervention (7.18), ease of configuration (7.06), good value (7.06) and easy installation (7.00). Oracle just missed the 7.00 mark with a 6.96 for ease of installation and scored well for ease of use and configuration. All the scores in this category were strong; the overall category average of 6.54 effectively tied the previous high of 6.55. Enterprise. IBM managed to slow down the Quantum juggernaut a bit in the product features rating category; it wasn’t enough to deny a victory, but certainly enough to give the company a run for its money. Quantum edged out IBM, 6.72 to 6.63, although IBM managed to prevail on two of the eight category statements, gaining its highest marks for management features and user interface. Enlarge ENTERPRISE TAPE LIBRARIES: PRODUCT FEATURES diagram. Quantum had the only 7.00-plus statement score with a 7.15 for scaling; it was just shy of 7.00 for performance (6.95) and an overall feature set that meets users’ needs (6.90). IBM’s highest scores were for scaling (6.78), overall feature set (6.74) and performance (6.73). All four vendors rated highly, with all statement scores coming in above 6.00. Midrange. Quantum kicked into overdrive with its second 7.00-plus category score, a very impressive 7.06 that resulted from scoring more than 7.00 on seven of the eight category statements. Rarely out of the top three statement leaders in this category, IBM’s 6.63 earned it second-place honors, while Oracle’s 6.55 put it in third. Enlarge MIDRANGE TAPE LIBRARIES: PRODUCT FEATURES diagram. Quantum’s highest scores were for management features (a very impressive 7.24) and interoperability (7.21). IBM’s top mark (6.81) was for overall feature set, while Oracle’s high score was earned for loading and ejecting tapes efficiently (6.73). Scores were strong for the entire field, with a record product features category average of 6.39. Enterprise. In the reliability category, Quantum came in second on two statements and was tied on another, but it still managed to roll up the highest mark (6.46). That slight chink in Quantum’s armor wasn’t enough for IBM (6.33) or Oracle (6.29) to prevail. Enlarge ENTERPRISE TAPE LIBRARIES: PRODUCT RELIABILITY diagram. Quantum “stumbled,” if you can call it that, on non-disruptive updates/patches (6.13 to IBM’s 6.24) and providing upgrade guidance (6.36 to Oracle’s 6.43). Midrange. 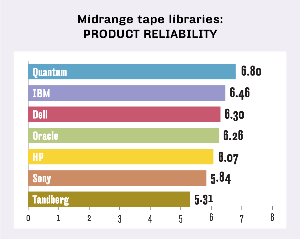 The product reliability category is typically something of an Achilles’ heel for midrange tape libraries, with scores dipping compared to the other categories. That’s true again for the overall average (6.15), but not for Quantum, which mustered an excellent 6.80 -- the highest winning score we’ve ever seen for midrange product reliability. 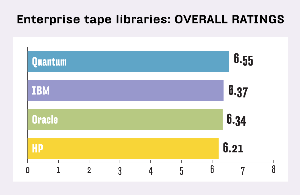 IBM finished second with a score (6.46) that would have been a winner in three of the previous five tape library surveys. Dell (6.30) broke into the top three by just barely edging out Oracle (6.26). Enlarge MIDRANGE TAPE LIBRARIES: PRODUCT RELIABILITY diagram. With the exception of IBM, most vendors were tripped up by the patches/updates statement, with most getting their lowest scores on that statement. Enterprise. Tech support is often the final measure of a product’s value, as responsive and effective support can outweigh skimpy feature sets or other shortcomings. Quantum’s winning 6.49 was achieved by copping the top spot for six of the eight category statements. Oracle (6.34) scored highest on the other two statements for a second-place finish in front of IBM (6.28). Enlarge ENTERPRISE TAPE LIBRARIES: TECHNICAL SUPPORT diagram. Oracle’s two statement winners were a 6.23 for having knowledgeable third-party partners and a 6.26 for providing adequate training. Overall, there was only one sub-6.00 statement score, which suggests vendors are doing a pretty good job of supporting their products. Midrange. 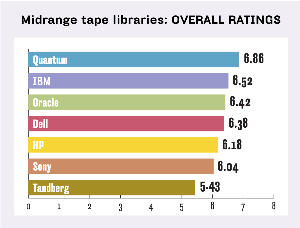 For technical support, it was another statement sweep for Quantum, on its way to a 6.77, the second-highest tech support category score ever for midrange tape libraries. Quantum’s scores were high and consistent, ranging from a couple of 6.60 scores to a 6.94. IBM racked up another second-place category finish with a 6.41, while Dell put up a 6.34 for another third-place finish. Enlarge MIDRANGE TAPE LIBRARIES: TECHNICAL SUPPORT diagram. 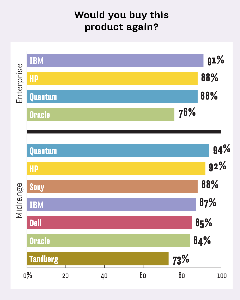 The top four vendors (Quantum, IBM, Dell and Oracle) all scored above 6.00 on all eight statements. Vendors may want to revisit their training practices as the statement with the lowest average score (5.90) was for providing adequate training. 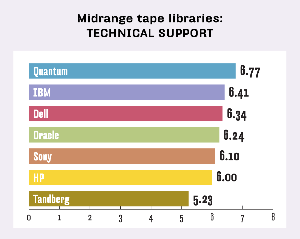 As with their enterprise cousins, the top support grade for all midrange tape libraries was 6.35 for the vendors delivering support as promised. Although not necessarily a measure of vendor service or reliability, the amount of data that passes through a tape library on a weekly basis may indeed be a gauge of users’ expectations, dependence and confidence in a product. Enlarge HEAVY HITTERS: TERABYTES BACKED UP PER WEEK diagram. Oracle -- likely due to its heritage stretching back to StorageTek Corp. and Sun Microsystems Inc.—sits atop both the enterprise and midrange groups when it comes to the sheer capacity its products churn through. Enlarge WOULD YOU BUY THIS PRODUCT AGAIN? diagram. We always make it a point to ask respondents, given what they now know, whether they’d make the same product purchase again. Often the “buy again” numbers run contrary to the ratings largely because users often feel a degree of loyalty (or at least familiarity) after having worked with a product for years. This time around, the “buy again” numbers jibe pretty closely with the ratings.